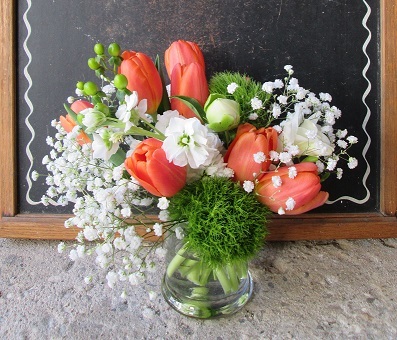 This weekend I was emerged in a bevy of blooms and loved every minute of it! 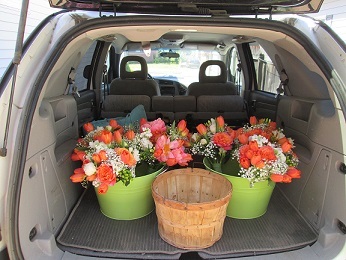 I was so pleased when I was asked to do the flowers for a wedding this weekend. The bride and I had a couple of consultations over the last few months and I designed and planned the following. 22 centerpieces, 6 bouquets, 4 corsages, and a few arrangements for the reception. 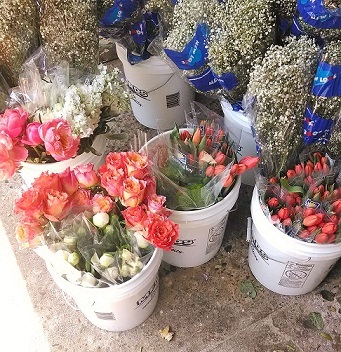 I miss working with flowers SO much! I really hope to keep getting a random job here and there. 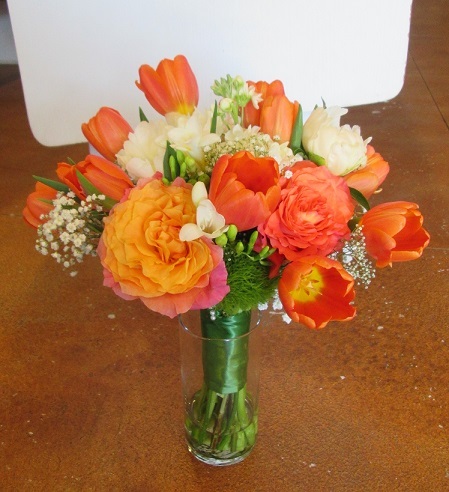 Flowers used: coral peonies, white peonies, trick dianthus, protea, babies breathe, freesia, tulips, amazing free spririt roses, hypernicum, and stock. 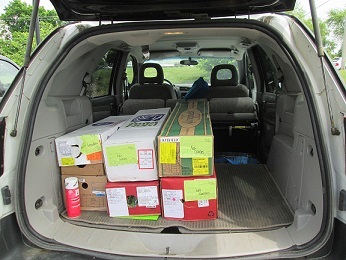 Picking up flowers at the wholesaler. Yep, they come in boxes! Back home the flowers get a quick trim and get back in water as quick as possible. Then onto further processing-stripping leaves, and dethorning roses. I made 2 identical small arrangements. One for the bar and one for the guest book table. Another small arrangement for the bar area. Wrist corsages are completed with strips of paintings made by the bride. 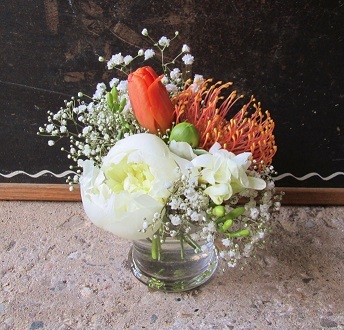 A gorgeous arrangement for the seating chart table. 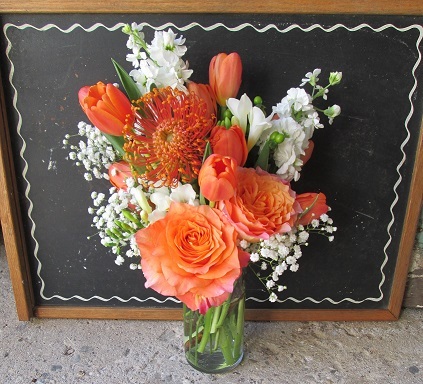 I'm loving this vintage chalkboard as my photo background too! 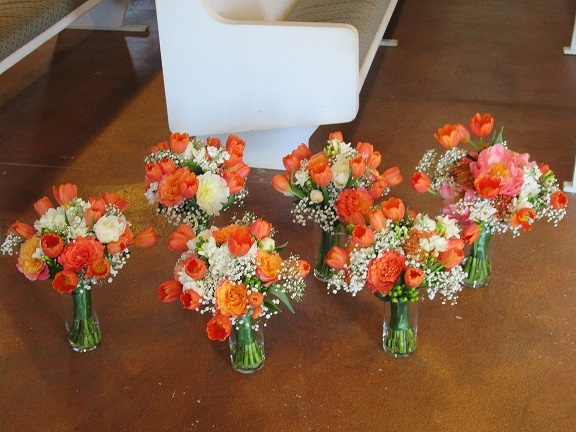 I did the centerpieces at the reception barn the day before so the day of the I just had to load up the bouquets and the corsages and hit the road. I was relieved when they all arrived safely! I trimmed and wrapped the bouquets with ribbon at the venue since I had to travel and wanted them to drink as long as possible. 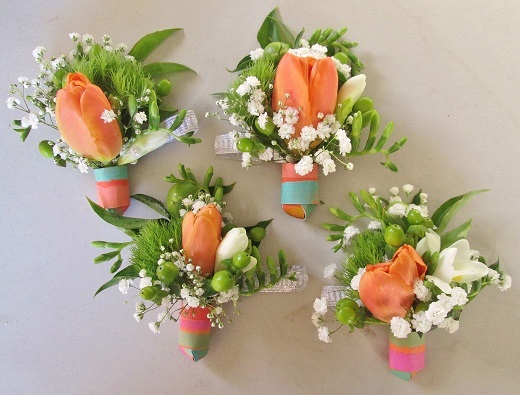 One of the 5 bridesmaids bouquets. The maid of honor also had an extra special flower that was only featured in the brides bouquet. The bridal bouquet! 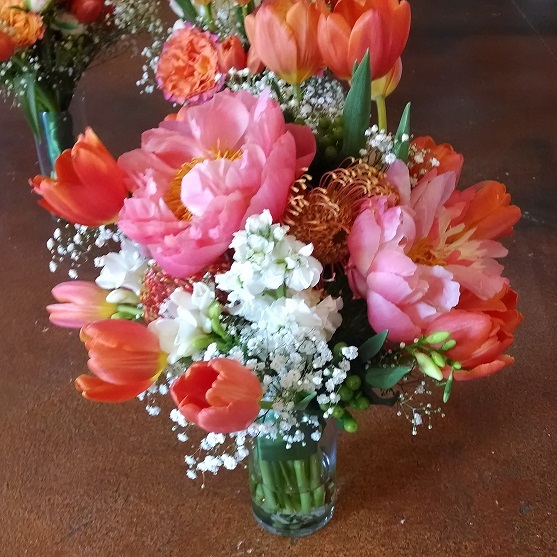 Gorgeous coral peonies and protea really made it special! 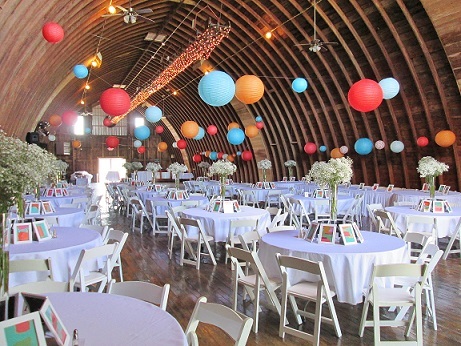 Check out how gorgeous this venue looks. Centerpieces where a simple babies breath arrangement in long tall vases. The bridal party whipped this place into shape so fast with lanterns and the brides paintings which each guest were lucky to take home. More More MORE NEW DESIGNS! The first half of the year has been busy busy in the studio cranking out new work. 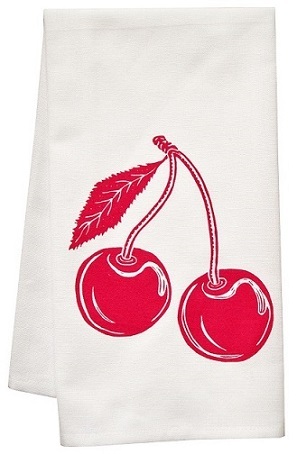 A cherry towel has been on my list for awhile now, and by awhile I mean at least 2 years. What can I say, time flies and I’m only one person. Cherries were a summer staple growing up. We got gobs of them at the farmers market to can and freeze and make into pies. I remember sitting at my grandma’s table pitting them, and dangling the double ones over our ears like earrings. Then there’s Wisconsin, a departure from my usual linocut designs. 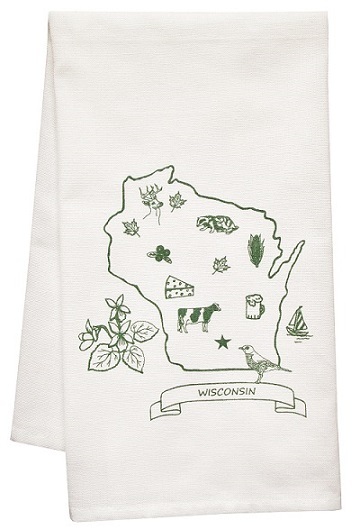 After making Michigan I got a couple of custom state requests and voila WI was born. I’m not sure how many will develop in this series. It sure is interesting to research each state and fun to incorporate teeny tiny drawings into the design. Both are now available here in my Etsy shop. It’s amazing just how quickly all the leaves came out and the plants popped up this year. It seems every year we go from when will winter end, to oh it’s 90 out. Not that I’m really complaining about insta summer, but it’s a little disorienting this year. With the nice weather comes one of my favorite activities-gardening. I’ve spent several of the last weekends gardening at the cottage splitting perennials and replanting them and making new garden areas, and of course helping mom get the big veggie garden in. With gardening sometimes comes the occasional poison ivy when you get into certain spots. And a few spots, I’ve got. This color of the month sponsored by green poison ivy! 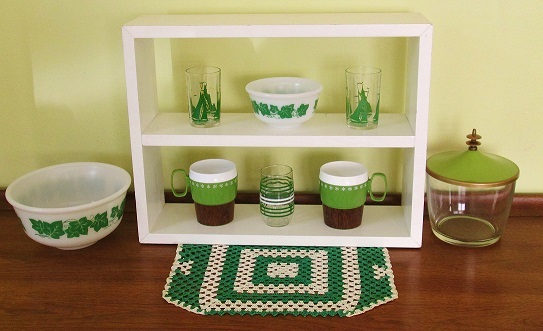 Fave vintage pieces: Hazel Atlas ivy bowls, crocheted placemat, juice glasses including 2 rare green sailboat swanky swigs, mid century ice bucket, and plastic thermoware cups! 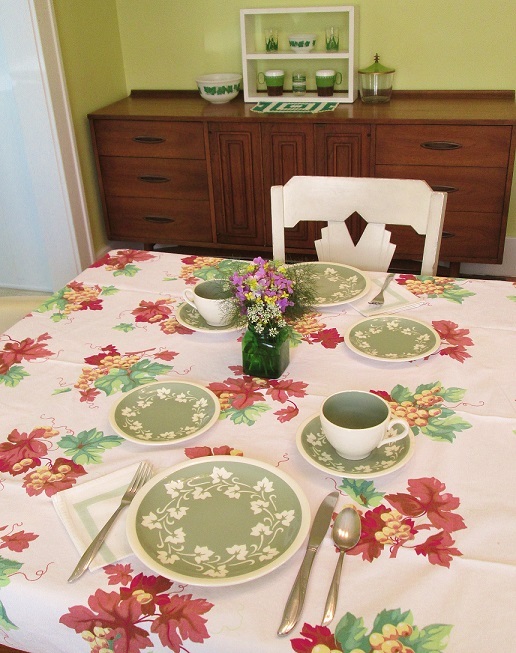 A little bouquet from my garden makes a nice centerpiece on this vintage tablecloth. Harkerware ivy dishes, and pale green stripe napkins complete the look.